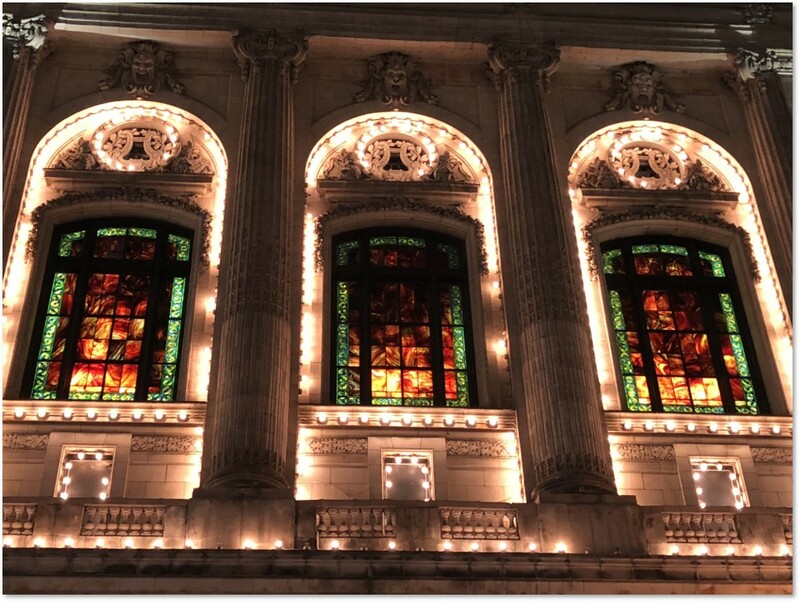 Walking by the Cutler Majestic Theater after dark last week, I was struck by its beautifully backlit stained-glass windows. They glowed in brilliant colors that warmed the night on the edge of Boston’s Theater District. I had not been in the Cutler Majestic for many years—since it had been “modernized” into a movie theater. In a different time, the theater had a different name and function. I never saw it in its original glory. So, when I had the opportunity to attend an event recently, I jumped at the chance to see what the Cutler Majestic looks like now. Would the rest of it fulfill the promise of those beautiful windows? Be assured that it does—and then some. 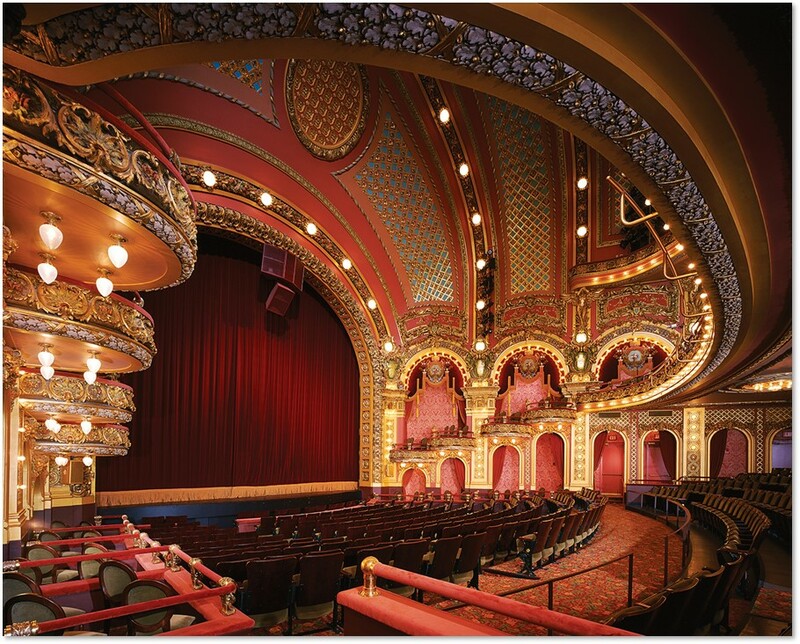 The Cutler Majestic, now owned by Emerson College, remains one of the palatial theaters that once were considered de rigeur for any dramatic production of quality. Once, these theaters studded American cities. Many fell to the wrecker’s ball while others were converted into more mundane uses. The Majestic Theater opened on February 16, 1903, with a performance of “The Storks,” a light musical comedy, with Isabella Stewart Gardner in attendance. It was commissioned by Eben Dyer Jordan, son of the founder of Jordan Marsh department stores. The architect, John Galen Howard, designed a Rococo palace in which light, specifically electric light, was an important component. The Majestic was the first theater in Boston to have electric light designed in from the ground up, rather than being converted from gaslight. Nearly 5,000 bulbs burned when the theater opened. Mr. Howard, a native of Chelmsford MA, had graduated from MIT and attended L’École de Beaux Arts in Paris. In the United States, he worked as a draftsman for Henry Hobson Richardson as well as other prestigious architectural firms, including Shepley, Rutan and Coolidge and McKim, Mead and White. He had a long and distinguished career that included Supervising Architect positions tor the University of California Berkeley and the Alaska Yukon Pacific Exposition in Seattle. This is his only known Boston work. 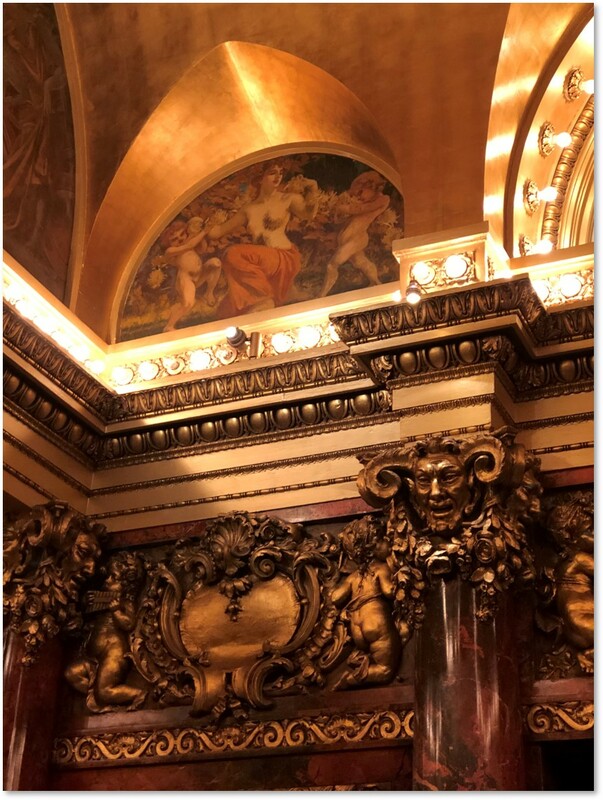 Mr. Howard designed The Majestic theater in a combination of the Classical and the Beaux Arts styles with a heavily decorated Rococo interior. The Cutler Majestic has had as many names as it has different lives. It began as a theater for live drama and opera. Three years after opening day, Mr. Jordan sold it to the Shubert Brothers, who converted it to vaudeville in the 1920s. In 1956, the Sack Theater chain purchased The Majestic. 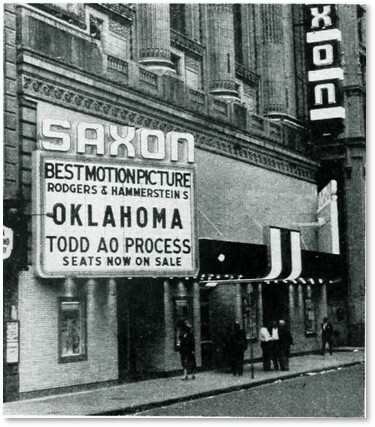 They changed the name to the Saxon Theater and “renovated” it in a way that obscured much of the original design. That’s how I remember the theater. I saw My Fair Lady and other big-screen extravaganzas here. It was a great date venue. I paid no attention to what architecture was visible–and you can see what they did to the entrance..
By 1983, the Saxon Theater was on a downhill slide. Less attendance meant less investment in upkeep and maintenance and it eventually closed. Emerson College purchased the structure a few years later, saving it from demolition. The school then began the process of restoring The Majestic to its former glory with a $14.8 million restoration project overseen by Elkus Manfredi Architects. Boy, did they ever succeed! The Majestic re-opened in 1989 and in 2003 was renamed the Cutler Majestic in honor of Ted and Joan Cutler, who funded the restoration’s final phases. Mr. Cutler was one of Boston’s great arts philanthropists and a graduate of Emerson College. A touch? Rococo decoration provides a wealth of visual interest. As with any Rococo structure, so much detail competes for your attention that you almost don’t know where to look first. From the Numidian marble lobby to the proscenium arch, the theater is a visual feast. The architect used electric lights, then newly invented, to highlight the façade’s arches and columns and to backlight the façade’s gorgeous stained-glass windows from Tiffany Studios. In the lobby, they act as footlights for six semi-circular murals by New York artist William de Leftwich Dodge. Two large paintings at the north and south ends of the central lobby represent music and dance in two classic aspects. One is a Grecian woman dancing in a garden of vibrant red flowers. The other depicts an Egyptian dancer on a terrace. The four small panels, or “Lunettes,” show classical scenes of joy, action, and repose. Inside the theater, nearly 4,500 bulbs outline the arches over stepped box seats and the edges of the cantilevered balconies. Glowing light fixtures illuminate the space under the boxes. Everywhere else the décor leans heavily on gilded carvings and a kind of marble composite called scagliola and marezzo. The wood carvings give us swags and garlands, masks and medallions, putti and seashells, flowers and grapevines, rosettes and ribbons. Carved and gilded wood covers almost every edge and surface. Where the gilding stops, red drapes and wall coverings fill the gaps. The Cutler Majestic offer excellent acoustics and the cantilevered balconies without supporting columns make for unobstructed views—unknown when it opened. More than one famous performer trod the boards there, including: Burns and Allen, Harry Houdini, John and Ethel Barrymore, Ruth Gordon, W.C. Fields, Al Jolson, Ruby Keeler, Ethel Merman, Ed Wynn, and the Marx Brothers. Experts report the acoustics as “impeccable” because of the auditorium’s inverted bowl shape. The Cutler Majestic is listed on both the Massachusetts and National Registers of Historic Places and is a Boston Historic Landmark. Should you choose to reserve one of it nearly 1,200 seats, Boston Magazine recommends Rows C and D of the central balcony. Here you will find the original seats from the orchestra level, complete a small hook and a shelf beneath to hold a cane and a top hat. Don’t forget your top hat. This entry was posted in Boston, History and tagged Boston, Cutler Majestic Theater, Eben Dyer Jordan, Elkus Manfredi Architects, Emerson College, John Galen Howard, National Register of Historic Places, Saxon Theater, Shubert Brothers, Ted and Joan Cutler, Tiffany Studios, vaudeville, William de Leftwich Dodge by Aline Kaplan. Bookmark the permalink.